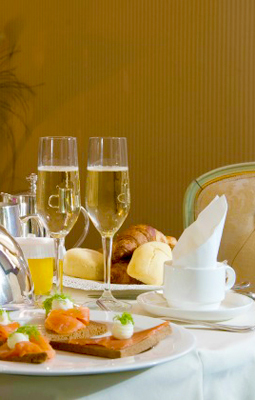 Champagne Breakfast in your room to get your day off to a Great Start! A simply romantic morning, our Champagne Breakfast in Bed sets you apart from the rest. It includes smoked salmon, crispy croutons and sauce, scrambled eggs and bacon, two flutes of Italian Sparkling Wine plus our continental breakfast.